With Venus in Taurus for the next four weeks, get ready to slow down and engage all your senses! Venus in Taurus may make you more lazy too, like a satiated cat purring happily and unwilling to budge… So what? It’s only three and a half weeks out of a whole fifty two per a year… Spring is here, the world is in bloom and it’s time for you to just relax and enjoy! With beauty-goddess Venus in Taurus, it’s the more curvy, feminine look that pulls the eye. Go for a classic style and do your best to look expensive. Less is more. A luscious fabric, a gentle perfume and a choice accessory are all you need to hit the spot. Love and appreciation are measured in quantifiable terms with Venus in Taurus. A good meal, an exclusive gift, gorgeous-smelling flowers, great chocolate and wine, soft fabrics or a sensuous spa treatment are great ways to show someone you care. And above take your time. Taurus hates to be rushed. Make each romantic moment last as long as possible! No need to break the bank. Taurus is sensible. Just show someone that they are worth that little extra. Does a special someone have Venus in Taurus? Find out how to please them at Venus in Love: Where Does Cupid Strike? 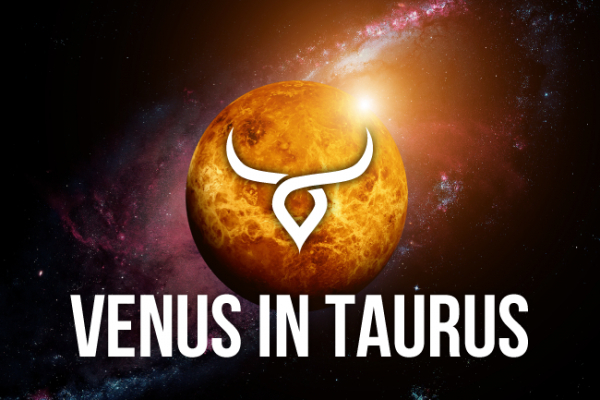 Venus in Taurus: How to make the most of this sensual astrological aspect. Earth signs will see their sensual allure increase ten-fold! Taurus, Virgo and Capricorn, let others be wowed by your elegance and allure!Venus in Taurus has special delights in store for all zodiac signs. Water signs, Cancer, Scorpio and Pisces will be more in the mood for love and socialising. Fire signs Aries, Leo and Sagittarius have just had Venus bring them love and happiness in April. As for air signs Gemini, Libra and Aquarius, it’s your nearest and dearest that bring you this period’s happiest moments. This astrolofical aspect brings the desire for love, self-indulgence, luxury and pleasure in different ways for each star-sign. Venus in Taurus has special delights in store for all zodiac signs. Read your horoscope and find out yours! Money doesn't grow on trees but you wish it would because there are many nice things in the shop windows all of a sudden that you want to buy. You’re one of them in some ways, because your stock is up and everybody wants in on your assets. If you’ve got it flaunt it! Time to enjoy that nest egg of yours and put it toward something special. Fancy a romantic escape? This is the perfect time for it as Venus in Taurus puts you in a romantic mood, eager to slip away with the one you fancy and enjoy some time far from everyday cares. If there’s nobody catching your fancy - and we’re not ruling out a secret crush here! - then a spiritual retreat might be just the business. One where you do yoga and luxuriate in nature. Are you two just friends? Or is there something more going on? Someone is wooing you, ever so gently, delicately crossing the line between love and friendship and making you feel like a million dollars. Or maybe they’re actually offering you a million dollars? Maybe not quite a million but someone thinks you’re definitely worth it! You’re the star of the show with Venus right at the top of your horoscope, dear Leo! You’re running the show, are beautiful and talented to boot, and someone high up there is sure to recognize your true worth! If you need a new business wardrobe this is a good time to go shopping. If you want to make a million dollars you need to look like a million dollars! Love is innocent, fun and carefree whilst Venus is in Taurus, dear Virgo. This is the best time to get away with your sweetie, enjoy a luxury holiday or take a nature break. For those single Virgos out there, travel and romance go hand in hand till July 5th. Academia, seminars and media events could also be lucky for you love-wise! Venus may be right at home in Taurus but she also rules your sign. You’re not feeling like your usual sociable self, dear Libra, with Venus in Taurus and prefer to spend quality moments with the person that you feel closest to. Intimacy is very rewarding over the next few weeks and you could also benefit from someone’s generosity. Others have good things in store for you, dear Scorpio! Venus rules your relationships and they’re running pretty smoothly right now, courtesy of Venus in Taurus… Someone could catch your eye if you’re single or you might want to spoil your partner rotten if you’re hitched. Couple up! Pleasant times lie ahead! Venus in your house of love can only be good news, dear Capricorn! Only the real thing can win your heart - no cheap copies please - and Venus in Taurus could well deliver the real thing. All you have to do is give yourself space for some extracurricular activities. Go out, flirt, have fun! Married with kids? You might feel like splurging on your children.